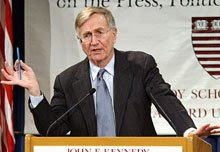 I said what I said, they can always say what they say,” Hersh told TheDaily Beast. “The last time they said the government doesn’t torture, this time it’s the government doesn’t assassinate. Hersch was right about My Lai, he was right often enough that he has yet to be successfully sued for publishing any untruth. If it comes down to whom a rational actor would believe between Hersch and Cheney the choice is simple. Grunts in Vietnam talked freely to Hersch because he was one of the very few people there who was interested in the truth. They are doing the very same thing right now. I think that the time for Special Prosecutors has passed. I don't have enough faith left in our Justice Department's committment to the rule of law. I would prefer turning things over to the World Court at the Hague. A fair trial and open hearing for the people who denied them to others would be the perfect way to re-assert our national ideals. Who knows? Some day we might even try to live up to them.